SALISBURY – The Community Foundation of the Eastern Shore (CFES) recently unveiled its Spark Campaign in honor of the foundation’s 35th anniversary. The campaign aims to provide more than $210,000 in combined funding for the three education foundations serving the Lower Eastern Shore. The Wicomico County Education Foundation, Worcester County Education Foundation and Somerset County Public Schools will be the beneficiaries of this anniversary initiative. From April 4 to Oct.15, the participating education foundations will each raise at least $35,000. The CFES will then provide up to $35,000 for each education foundation in a 1:1 match. The goal is for the education foundations to raise a combined $105,000 matched by an additional $105,000 from the CFES for a total of $210,000 for shore education needs. The education foundations will each be empowered to use their funds to best meet the needs of local students. Programs facilitated by the Spark Campaign will help ensure that students not only have high quality facilities, teachers, and curricula, but also the resources to nurture creativity, aid students in times of struggle, encourage them to strive for personal success, and allow them to thrive in the classroom and the community. “Our students are the heart of our community, and we are working hard to give them the tools they need to be successful. 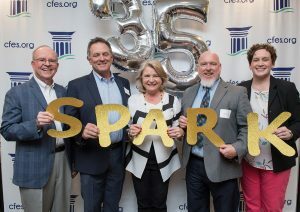 The Spark Campaign highlights education as an allied community priority,” said Ray Thompson, chair of the Worcester County Education Foundation.